Just Celebrity was delighted to get to know upcoming singer/songwriter John Galea a bit better. JC: You are a singer and songwriter, how long have you been making music? J: Since I was about 13 , when I first got my set of keys and started to learn to how play and perform. JC: How would you describe your music for the public audience if for an example they have never seen you before? J: Its a mix of Elton John meets Rudimental type of vibe. 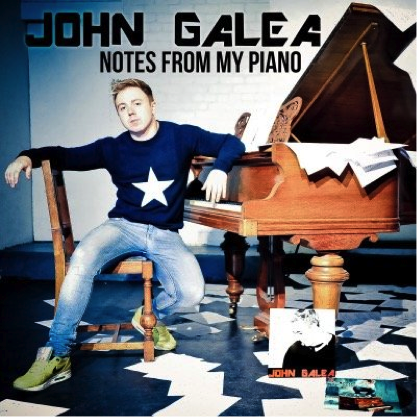 JC: Did something or someone in particular inspire you in writing the song ‘Notes From My Piano’? J: Its based on a past relationship I was in , and I decide to base the E.P on that and have classical elements to the E.P. JC: How does your music stand out compared to other songs within the same genre? J: Its very honest and very personal, its very classical based to whether chords or melody. I’m at the stage I’m using the classical training when it comes to writing the tracks. JC: As an artist, is there anything special you hope to be able to achieve? J: Just getting the music out there for me is more than enough, I’ve been very lucky enough to work some amazing musicians and singers and perform at some cool venues and thats all a bonus to me. JC: Can you tell me more about the tour? What can fans expect from you? J: Its starts in London and myself and my live band will be touring round the UK from London to Manchester to Edinbough its going to be high energy but very honest to the tracks on the E.P. I can’t wait to get back on the road again. JC: Thank you so much for the interview, good luck John!